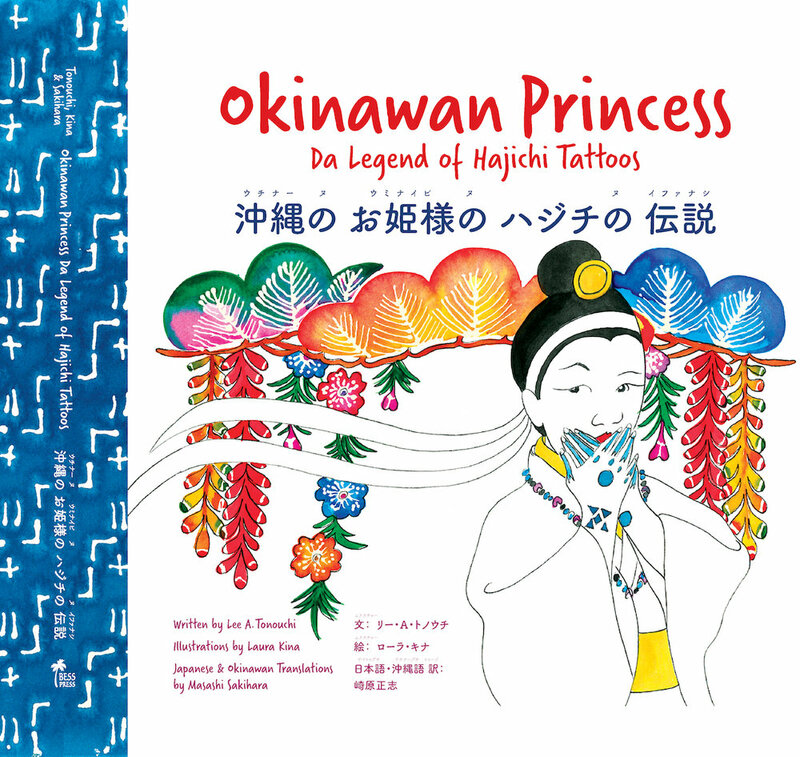 Okinawan Princess: Da Legend of Hajichi Tattoos is an illustrated, transpacific feminist fairy tale for all readers that illuminates an ancient tradition and pushes back against normative standards of beauty. When Gramma notices how much her granddaughter wishes she could look like a supermodel, Gramma shares how her own mother was made fun of when she moved to Hawai‘i from Okinawa due to the bold blue hajichi tattoos on the back of her hands. Gramma then reveals the legend behind those mysterious markings. When the Okinawan Princess is kidnapped by Japanese pirates, will she wait for someone to save her or will she be able to outwit her captors? This trilingual story is written in Hawai‘i Creole, then translated into Japanese and the endangered indigenous Okinawan language called Uchinaaguchi. “Okinawan Princess” is part of ongoing efforts to revitalize Okinawan language, history and culture worldwide. Lee A. Tonouchi is a full Okinawan yonsei born and raised in Hawai’i. He is known as “Da Pidgin Guerrilla” for his championing of Pidgin a.k.a Hawai’i Creole to be accepted as a legitimate language. His last book, Significant Moments in da Life of Oriental Faddah and Son: One Hawai’i Okinawan Journal, published by Bess Press, won the Association for Asian American Studies Book Award for Poetry/Prose. Laura Kina is a “hapa, yonsei, Uchinanchu” artist and educator based in Chicago. Her artwork addresses Asian American and mixed race identities and histories with a focus on Okinawa and Hawai’i diasporas. She is a Vincent de Paul Professor of Art, Media, & Design at DePaul University and coeditor of War Baby/Love Child: Mixed Race Asian American Art (University of Washington Press, 2013), and Que(e)rying Contemporary Asian American Art(University of Washington Press, 2017).